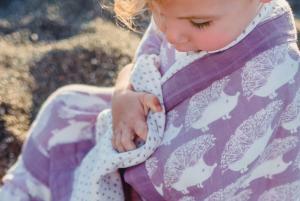 The Big Lovey is the softest snuggliest organic cotton and rayon from bamboo muslin baby blanket we've found. It's got just enough weight for your little one to cozy right into and is just the right size (36" x 36") to wrap up in. Also available in "mini lovey size"